It’s been five years since Hard Rock Park first opened to the public. With a fantastic design, unique attractions, and dozens of great details, it was enough to make any theme park or rock n roll fan drool. Clearly everyone involved on the project put a lot of passion and care into the park and they were convinced it would be a slam dunk with guests. What does the creative team do after they open to the public? Take a few months off and see how customers react, then sketch out some new concepts? Actually, Jon Binkowski and his team were already looking to the future – they were certain their park needed to be expanded quickly for extra capacity and fans would be itching for more. Today Theme Park University shares exclusive behind the scenes artwork on what the future Hard Rock Park might have looked like. One of the details I left out of my last article was the Heavy Metal Graveyard located just beyond the Eagles Life In The Fast Lane roller coaster. 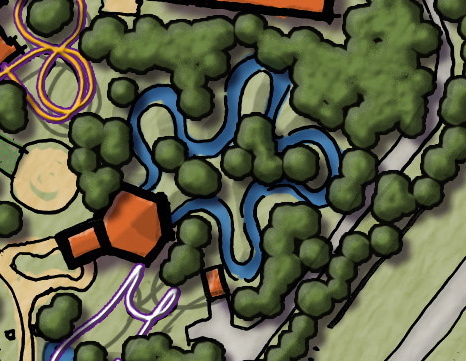 This area featured several outrageous sculptures that represented bands synonomous with Hard Rock along a winding path that lead to… well… nowhere. Long term, this pathway would have been the exclusive entrance for Hard Rock Hotel guests. That’s right, Hard Rock was planning to open their own hotel on the other side of the Intracoastal waterway. The design resembled a southern plantation from the outside, similar to Port Orleans Riverside Resort at Walt Disney World. On the inside, the decor would have looked like a rock legend bought the place and covered it with their memorabilia: guitars on the walls, oversized portraits of rock legends and chandeliers made of saxophones. 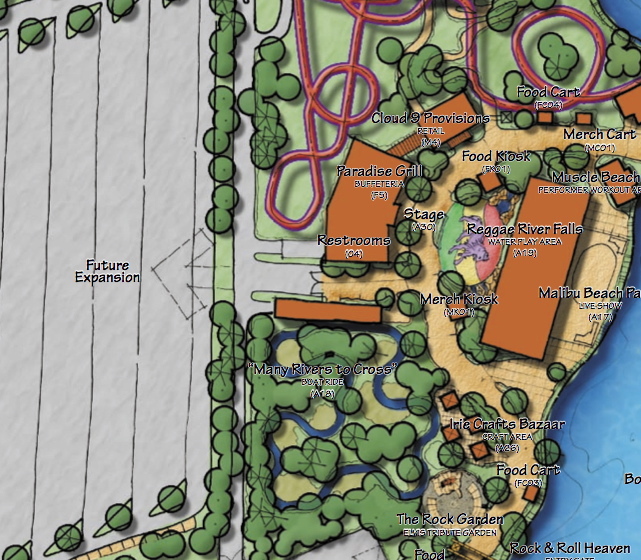 Concepts for the resort were drawn up that included restaurants, convention rooms and a massive swimming pool complete with a lazy river that Hard Rock Hotels are known for. The company just wanted to wait one season before starting construction, but they were ready to roll! 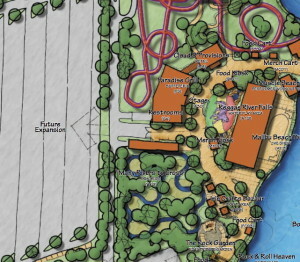 The resort wasn’t the only project in development beyond the gates of the park. Paradise City was designed to be a multi-purpose complex that would have eventually ended up in the parking lot of Hard Rock Park. The idea was for guests to park their car in a new garage just beyond this new area, then walk through Paradise City to get to the entrance turnstiles, much like Citywalk at Universal in Orlando and Hollywood. Not only would Paradise City contain the usual shopping, dining and cinemas, but also a small community. 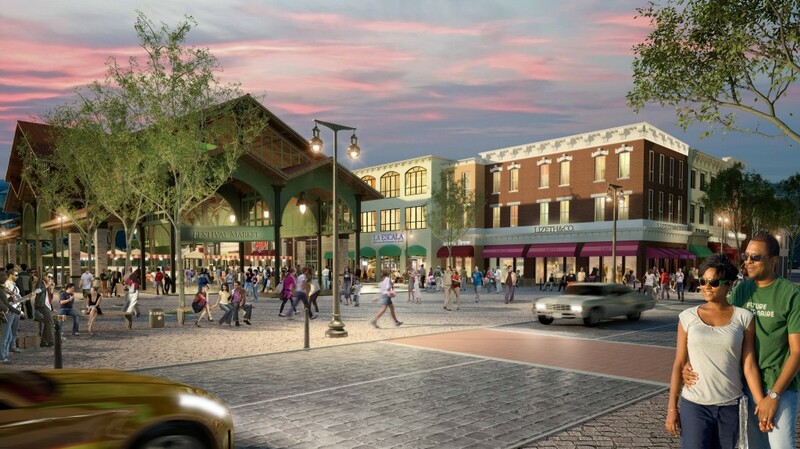 If you take a look at the artwork above, notice the lower sections contain storefronts housed in buildings ranging from three to six stories. Upper floors were set aside for condos and timeshares where you could live just steps away from Hard Rock Park. Something else to consider: the names used for stores and restaurants in the concepts above are placeholders, no merchants were contacted at this point in the process. Jon Binkowski also wanted another idea to get pushed out into the parking lot. Rock N Roll Heaven was always designed to be a lush, tropical landscape perfect for water attractions. The budget allotted for opening day just didn’t include enough money to build everything he wanted. Welcome To The Jungle was going to be a water rapids ride set to Guns and Roses most famous hit. It would have been the world’s first rapids attraction featuring on-board sound, most likely provided by JL Audio, who did such an amazing job with all the other ride vehicle’s sound systems throughout Hard Rock Park. Adjacent to Welcome to The Jungle, would have been Many Rivers To Cross, based on the reggae song Jimmy Cliff wrote in 1969. This would have been an outdoor slow-moving boat ride that would have taken guests on a musical history of rock n roll. Many Rivers would have dropped riders off at the Rock Garden in Rock N Roll Heaven – a small walkway that honored rock n roll legends, which was already in the park on opening day. No specific show elements for either attraction were developed, because the goal was to use the $400 million they had to get the park open. Space was still there and set aside for future expansion. 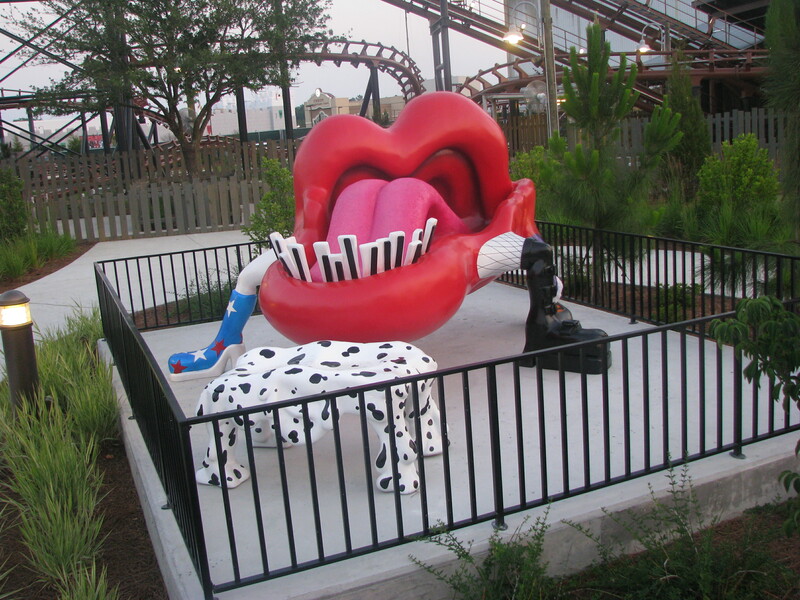 Another brilliant design element that Jon added to Hard Rock Park from the beginning was a parade route. 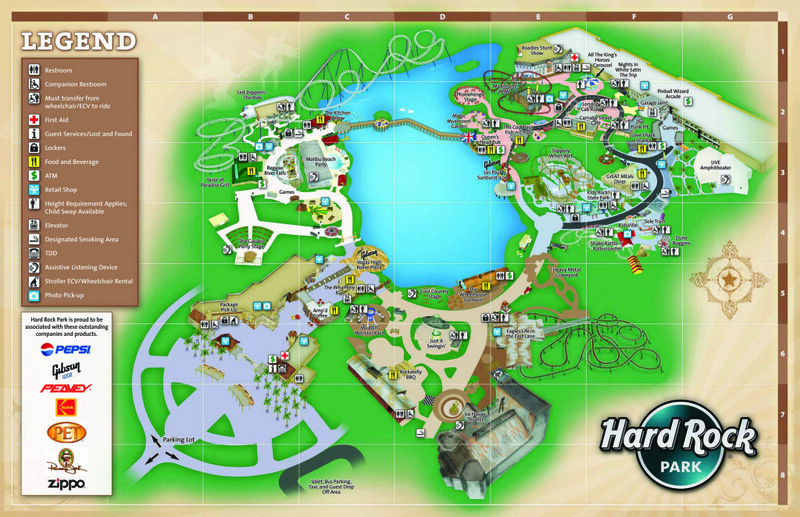 Take a moment and click on the park map above to expand it to fit your screen. Notice the walkways in Rock N Roll Heaven and British Invasion on the left, are narrower than those found in Cool Country and Born in The USA on the right. These paths were intentionally designed wider to drive parade floats through the middle, allowing room for thousands of guests to view it from either side. The parade would have stepped off beside the Ice House Theater in the lower left and travelled up to the Live Amphitheater in the upper right. In addition, Peavey – a sponsor for Hard Rock Park, provided speakers used for the background music in each environ. In addition, they were also wired to integrate with the sound systems on parade floats. Essentially, once the park was a success and needed extra entertainment to keep guests satisfied – a parade could be designed and added quickly to meet that demand. Another great addition to the park wouldn’t have been accessible by the general public. The Little White Chapel was an idea created for couples wanting a slightly less traditional wedding ceremony. Possibilities for a Hard Rock Park wedding were virtually endless – since they had plenty of bands, magicians and characters that could be used to entertain the wedding party before and during the ceremony. Plus, how cool would wedding photos be of the bride in her gown, the groom in his tux and their families all “taking the plunge” together on Led Zeppelin The Ride after the couple tied the knot? 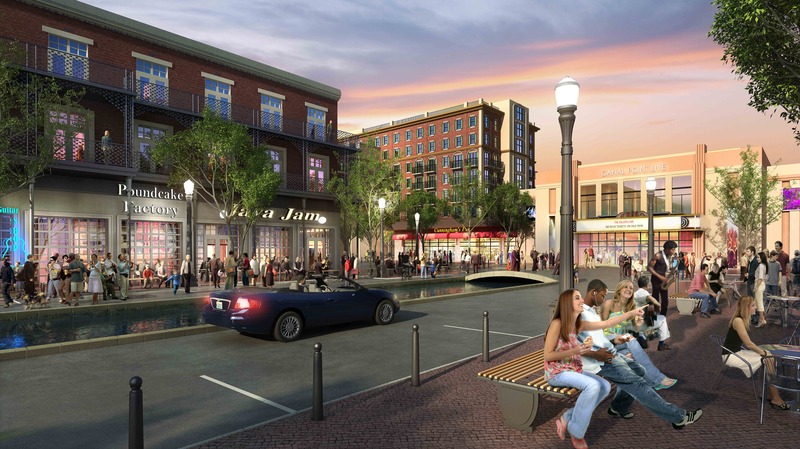 If all of the above isn’t enough to wet your whistle for what would have been the future Hard Rock Park, there’s more! Come back next time and I will share concepts never realized for an attraction themed around the rock band KISS, some very smart ideas for seasonal events, a carousel themed to a Beatles song and a high-speed convertible E-ticket attraction that would have taken guests speeding through Route 66! Until then, if you could take a moment and like our Theme Park University Facebook Page by clicking on the link to the right, it would be greatly appreciated! That’s the easiest way to find out the latest on what is going on here at TPU. Meanwhile, I would love to hear your feedback in the comments section below. Editor’s Note: A special thank you to Jon Binkowski for sharing all the concept artwork in this article, a true visionary ahead of his time. This entry was posted in Extinct Attractions, Hard Rock Park and tagged Guns N Roses, Hard Rock Park, Hard Rock Park attraction concepts, Hard Rock Park concepts, Hard Rock Park Hotel, Jon Binkowski, Many Rivers to Cross, Paradise City Hard Rock Park, Welcome to the Jungle, White Wedding Chapel. Bookmark the permalink. Trackbacks are closed, but you can post a comment.